The 2019 Hyundai Tucson is a mid life-cycle update to the SUV, but brings a major upgrade to the interior. The centre console has seen a major overhaul with a new floating touchscreen infotainment system in place that now rises from the dashboard similar to that of the new Kona. The air vents have also been moved below the touchscreen unit instead of flanking the display. The cabin also boasts of a revised instrument cluster and an electronic parking brake thrown in the mix. Under the hood, the 2019 Hyundai Tucson continues to get the 2.0-litre four-cylinder petrol engine with 164 bhp and 204 Nm of peak torque. Hyundai has introduced a new 2.4-litre four-cylinder petrol engine with 181 bhp, which replaces the 1.6-litre turbocharged engine with 175 bhp that was previously available on the model. Both the 2.0-litre and 2.4-litre mills come paired to a 6-speed automatic transmission in the US. Hyundai will be introducing the 2019 Tucson facelift in the US towards the end of this year. The updated SUV can be expected to make its way to the Indian market sometime in 2019. The 2019 Hyundai Tucson facelift has been unveiled at the New York Auto Show with refreshed styling, more power and a host of new tech on offer. 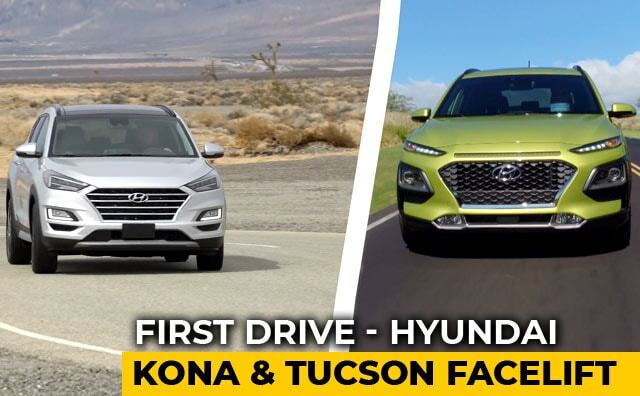 The Hyundai Tucson is positioned below the Santa Fe in the automaker's line-up and the updated model borrows cues from the latter. Hyundai Motor will be revealing the refreshed 2018 Tucson SUV at the upcoming New York Auto Show, on March 28, 2018. This particular Hyundai Tucson facelift has likely been designed specifically for the US market and the SUV is expected to come with a bunch of visual updates along with some new features.